In the 50mm category, these very compact binoculars contain HD lenses to minimize color fringing (chromatic aberration) and guarantee razor-sharp images with the highest possible resolution. The EL 50mm SWAROVISON provides viewing comfort through the entire wide-angle field of view with amazing edge to edge sharpness. The sturdy, removable twist-in eyecups have been designed with four intermediate stage settings making it easier to adapt the individual distance between the ocular lens and eye. The new focusing wheel made from hard and soft components is non-slip, sturdy, easily and accurately operated. It is possible to change the setting from the close to infinity very quickly with only two complete turns. This unrivalled close is particularly beneficial for the macro observation world. The time-tested and elegant EL design with wrap-around grip has also been optimized. Thanks to their rubber armouring, the binoculars are easy to handle even when cold and the ergonomic thumb rests ensure a perfectly balanced observation. The practical accessories are yet another plus in terms of functionality. All new EL 50’s are supplied with a water-repellent bag, an easily adjustable Lift carrying strap, protective caps for eyepieces and objectives, plus the Snap Shot adapter, the latter is used to quickly connect a digital compact camera to the binocular for remarkable photographs taken at long distance. 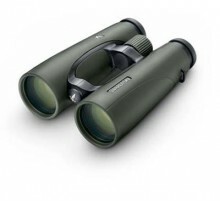 Click the button below to add the Swarovski 12x50 EL SWAROVISION Binocular to your wish list.